If you have an Amazon account, you also have five gigabytes of free online storage for your files at your disposal through the Amazon Cloud Drive service. You may not have known that, though, because accessing that space hasn't been as easy as it is with services like Dropbox and SkyDrive. That changed Wednesday with Amazon's release of a free desktop program for its cloud storage service. There are versions of the software for Windows Vista, Windows 7, and Mac 10.6 and 10.7. The software is a cinch to install in Windows. After downloading the program from Amazon, you simply double-click the app's installer. A window will pop up. Click install. At the end of the install, click "finish" and another window will appear asking for your Amazon log-in information. Fill in the fields, and you're ready to start uploading files to the Amazon cloud. When the drive app is running, you can send files to the cloud by right-clicking on a file on your computer, hovering over the "send to" option and choosing Amazon Cloud Drive from the "send to" menu. You can also upload files to the cloud drive by dragging them to the cloud icon that appears in the system tray. When you want to download or manage files on your cloud drive, you have to access it via a web browser. 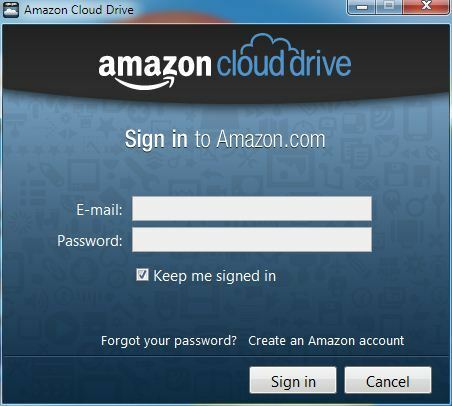 You can go directly to the drive at Amazon's website or right-click on the task tray icon and choose "Open Cloud Drive website" from a pop-up menu. Website access to files doesn't seem as convenient to me as the kind of local file management that can be done with Dropbox, Google Drive, and SkyDrive. For example, when you open Dropbox on a desktop, an Explorer-like window appears. You can drag files into the window to upload them Dropbox. You can drag files out of the window to download them. You can also create and delete folders and files--all without diddling with a web browser. Nevertheless, the new Amazon software at least makes saving digital content to the company's cloud drive much easier and makes the service more useful. By the way, if 5GB of free cloud storage isn't enough for you, Amazon offers pretty reasonable rates for paid storage: They start at 20GB for $20 a year to 1TB for a $1000 a year.